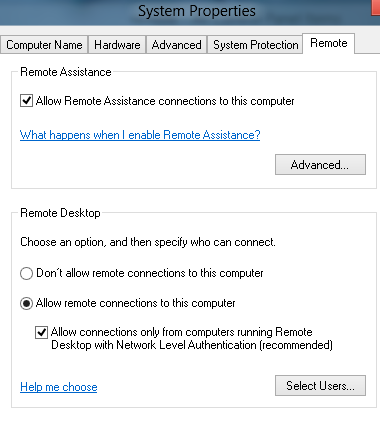 To access the remote desktop settings we must first open up the control panel. In windows 8 there are a few ways to accomplish this task. For this example we will utilize the new hot corners. Move the mouse to the bottom left till the hot corner(desktop or start) lights up. Now you should be able to go to another machine and RDP into it. Note: if the Windows 8 machine you are attempting to remove into has a user account setup using Microsoft Accounts (Windows Live ID) you will need to use MicrosoftAccount\liveIdName .